Sermon: What Is the Use of Proverbs? The following sermon was preached in the seminary’s Martin Luther chapel by Rev. Kurt Lantz on Wednesday, 2 October 2013. The text was Proverbs 28:3-10. As a parent and a teacher of children I have heard that phrase, “What’s the use?” many times and have seen it also in the attitude of many an adult, myself chief of all. What’s the use of making the bed? What’s the use of cutting the lawn? What’s the use of memorizing the explanation to the close of the commandments? What’s the use of Algebra? What’s the use of going to church? What’s the use of giving to the homeless? What is the use of proverbs? Who wants to be pro-verb, pro-action? Not a lazy sloth like me. When I get home from work that’s it. The collar comes off, shorts and t-shirt are put on, and I park myself in front of the television, not in order to be stimulated but in order to shut down. I don’t have to think. In fact I can watch the same thing I watched yesterday because I wasn’t really paying attention to it then either. The rest of the family doesn’t interrupt. I don’t know if they think I’m concentrating on something or if they know by now that I’ve shut down for the day. Proverbs, pro-verb. It sounds like work to me. I’m probably not up for that. When assigned to preach for this day and seeing the appointed readings, I checked to see if I had a sermon already written. I have one on the Ephesians 2 reading, last preached in September of 2010, unfortunately it was right here and not all of the students have yet moved on. So, I looked in the Proverbs file and found a few sermons, but not on this chapter. Proverbs doesn’t come up in the lectionary very often. What is the use of Proverbs? I recently heard it suggested that the short disconnected wisdom couplets might be good for a bathroom book, you know the kind you can pick up while sitting on the toilet and not have to worry about reading a whole chapter. Just a couple of lines to help you pass … the time. It’s starting to sound like work again. To ask, “what’s the use of proverbs” is to ask, “what’s the use of works.” “For by grace you have been saved through faith. And this is not your own doing; it is the gift of God, not a result of works … ” (Ephesians 2:8-9). There is no use of works in salvation. No use of your works, that is. You were not only lazy in regard to works. You were dead. Dead men’s works don’t count for much. But that was 2010’s sermon. What’s the use of works … actions, verbs? Who is pro-verb? Those Lutherans who have memorized Ephesians 2:8-9, stop short before they get to verse 10. There we are told that “we are God’s workmanship, created in Christ Jesus for good works which God prepared beforehand, that we should walk in them.” It appears that God is pro-verb. Why? What’s the use? They don’t save you. They don’t save others. “They will not believe even if someone should rise from the dead” (Luke 16:31). Your works don’t come close to that. Proverbs: “The one who keeps the law is a son with understanding, but a companion of gluttons shames his father.” Keeping the law is associated with understanding. The one who does not keep the law lacks this understanding, this wisdom evident throughout the Book of Proverbs. To quote Ephesians 2:8-9 like a good little Lutheran and dismiss works entirely, shows this lack of understanding, not of the law of works, but of the law as understood by the faithful Hebrews, the Torah, the whole teaching of God. Look at that glutton who ignored Lazarus begging at his gate, while he feasted sumptuously every day dressed in purple and fine linen. From heaven Abraham declared to him: “Child, remember that you in your lifetime received your good things, and Lazarus in like manner bad things; but now he is comforted here, and you are in anguish” (Luke 16:25). The rich glutton had no understanding of the law and he ended up in hell. You feast sumptuously on the body and blood of Christ for the forgiveness of all of your sins and there are poor beggars at your gate. What is your understanding of the law? How do you read it? 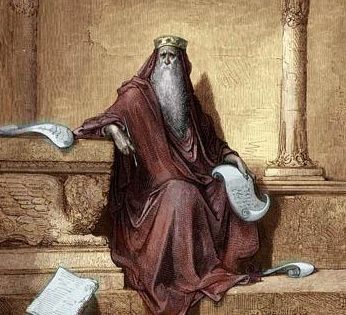 “The one who keeps the law is a son with understanding, but a companion of gluttons shames his father.” The one who keeps the law, who hears the Torah, who knows God’s Word, who believes the Gospel, is a son with understanding. He knows what’s the use of works. They are of no use to save him, but they are of use. They are God’s works prepared beforehand that we should walk in them. They give us understanding. They show us how not to shame our father. They show us the work of an obedient Son who is pro-verb, they show us our Saviour. When I teach the catechism class I summarize the distinction between Law and Gospel by saying, “The Law shows us our sin. The Gospel shows us our Saviour.” Perhaps it’s not that simple, for the Law, when it is fulfilled by Christ, is the Gospel. And when we keep the law we see Christ in our actions and He is Gospel. The things I’ve seen written by Lutherans on the internet would tell me that Walther’s theses on Law and Gospel may not have completely plumbed the depths of this paradox, at least not as good North American Lutherans seems to apply them. It is not okay to do or say whatever you want so long as you have the Gospel. The good news is that God is pro-verbs. He’s into good works, chiefly the work of His Son for your salvation, but also the good works that He has prepared for you, that you should walk in them. For God did not laze around in His throne room feasting away while we were beggars at His gate. He Himself came down from heaven in order to rescue us and share with us all good things. “For you know the grace of our Lord Jesus Christ, that though He was rich, yet for your sake He became poor, so that you by His poverty might become rich” (2 Corinthians 8:9). Do you want to really understand this? Then embrace the teaching of God—not only the Gospel, but also the Law, His complete Torah. “The one who keeps the law is a son with understanding,” not only of the Law but also of the Gospel. When you forsake your slothful and gluttonous ways, you no longer shame your heavenly Father (in that way) who is pro-verb, whose only-begotten Son went out to rescue you, the poor beggar at His gate. The shame that you have caused through your gluttonous sloth is taken away by the obedient Son who nevertheless was condemned for being a glutton and a wine-bibber? He fulfilled the Law for you through His life and death, and that is the Gospel, and you come to a better understanding of that when you keep the law and take care of the poor beggar at your gate. “The one who keeps the law is a son with understanding,” understanding of God’s great mercy and grace in Jesus.